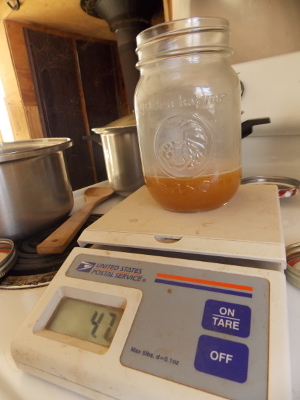 Among all trees, sugar content is low in sap at first, quickly rises to a peak, then gradually decreases over the sap run, with another little rise at the end (just as the taste turns "buddy"). So, if you're familiar with your sap season, you could presumably just tap trees during times when the sugar content is high. Sun makes sugar, so those trees with more branches and those trees more exposed to the sun tend to have higher sugar content in their saps compared to neighboring trees tested at the same time. We accidentally picked a winner in this regard since the tree we tapped is (strangely) on a south-facing hillside at the edge of our parking area, so the tree gets lots of sun all year. Larger trees make more sugar, and so do trees with wider growth rings (meaning they're growing faster). Trees that are sweeter than their neighbors continue to be relatively sweeter throughout the season and from year to year. Whether this is due to the factors mentioned above or whether the sweetness is genetic was beyond the scope of the study. Obsessive data collecting aside, I'm in love with the process of boiling sap down into sugar because the partway stage tastes just like vanilla extract smells. 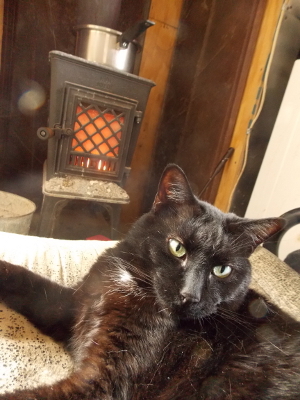 After letting the sap simmer on the wood stove until it was starting to thicken, I moved four days' supply over onto the electric stove for the final cookdown Saturday morning (taking over watch duty from Huckleberry). There are lots of ways to tell when your maple syrup is done, but I chose to eyeball it, backing the diagnosis up with a weight test. A gallon of maple syrup should weigh 11 pounds, so a cup of maple syrup should weigh 11 ounces. I figure we produced a bit less than half a cup of syrup, so the weight came out just about right. 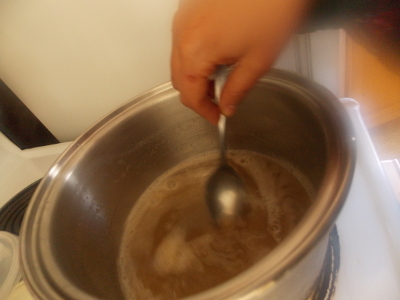 I also eked out another tablespoon or so by making hot chocolate in the cook-down pan, rinsing the syrup off the walls for the only sweetener in the beverage --- delicious! I really miss the maple sugaring we did up in Minnesota, when we had a batch boiling in our 80 gallon tank out in the "sap shack" someone would pull the "night shift" keeping wood added. I will have to post some pics when I can find and scan them. After I left home for the south not knowing I would not return, dad and neighbors have taken over, four men between ages of 65 and 84 still at it, about 50-60 trees tapped, using tubing from several spiles on several trees running down hill when convenient to a collection tank. We used PVC for the spiles and 5 gal plastic buckets when I was a kid, and a large tree (3' diameter) can get three spiles alone. My senior year in high school I made 23 gallons of syrup, just dad and I and I still went to school during the day. Yes, in SW VA you are too south to have that ideal climate where you get 25 night temps and no more than 40 day temps, when too warm the sap gets "buddy" and dark. Not every year in MN is ideal, they made no syrup in spring of '2012, it went from winter temps to 70* in about a week that year. Last year they made 9 gallons and the "grumpy old men" were tired of the manual labor lol! Anna has a copy of my folk's biography "Journeying Earthward" which talks about sugaring. Eric --- Actually, my mom borrowed your parents' book before I could get to it. I need to nudge her to read it or return it so I can review here! Nice job. I like the idea of continuous boil, too, but with a larger quantity, the outdoor logistics are daunting, and indoors the sugar in the steam would coat everything. So I boil 8am-4pm outside a few times and Jill finishes it on the stove. Here's a link to a forum of fellow Virginians tapping away: http://mapletrader.com/community/forumdisplay.php?41-Tapping-Virginia-2014 I'm wilfredjr there, too. I'll post when I tap in Tapping Wisconsin, likely mid-March, . It's 10° out and still 3' of snow in the woods. May not have enough firewood left to carry my 20 taps through.